Wellmo’s insurance customers deploy their service sets to millions of members. Usually insurance companies don’t produce services themselves but use partners, such as health care providers, coaching companies, third party apps etc. The integration of your health content, service or app to Wellmo is easy. Join us in selling to insurers. Wellmo’s mission is to help insurers in cooperation with healthcare content, app and service providers to leverage mobile health technologies for new innovative services. We enable effective, engaging and scalable digital and mobile health services. Wellmo’s root go back to Nokia Corporation’s venture organization, where the technical foundations were designed and built. Through flexible API’s, your existing services can easily be integrated with the Wellmo platform. 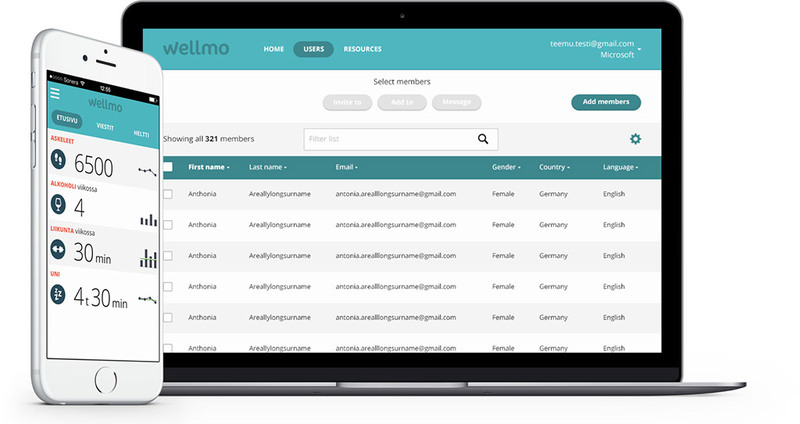 Expand your business and reach new end-users with Wellmo and our international customers. Wellmo’s clients are pioneering insurance companies. Wellmo helps partners to meet privacy and other relevant regulations. Wellmo is already now compatible with over 100 leading health devices, apps and services. You can benefit from the use of Wellmo’s capabilities such as access to phone sensor data, push messaging, connected device integrations etc. without the need to create and maintain them yourself. A highly customizable mobile platform for offering a menu of services for the user, such as health check and preventative programs for identified risk areas, remote care services, specific content pages, or care services tailored for specific chronic conditions. All accessible with a single-sign-on. Insurers can tap into or develop a network of local and global health content and service providers to suit their needs. Wellmo platform is already compatible with over 100 leading wearable devices, health apps and services. Insurers can provide tailored coaching for different risk groups, and use social challenges with own branded content for motivation. Would you like to know more about the Wellmo platform and discover the benefits for your company? We are happy to tell you more about the Wellmo platform at your convenience.